With A Bentley, you can never go wrong. Bentley has been outdoing just about every other luxury vehicle on the planet for decades and the gorgeous Bentley Azure definitely continues this trend. The Bentley Azure for all you fine automobile connoisseurs is a luxury convertible that offers not only incredible power and performance of an exotic, but luxury that even a king would find comfort in. Obviously, this car is a lot of money and we are talking much more expensive than most people’s homes, but this does not stop the ultra rich from purchasing this very fine automobile. So what do you look for when you have all the money in the world from an automobile- whatever it is, the Azure delivers it. Under the hood, you will find a huge 6.75 liter V8 engine and while it is smaller than the W12 engine found in other Bentleys don’t worry, it still produces 450 horsepower and an incredible 645 lbs ft of torque, more torque than most large pick up trucks. Matched with this winning engine is a ZF 6 speed transmission that is automatic, plus a sequential shift control. Other great features regarding this vehicle’s engineering includes a computer controlled adaptive suspension and an automatic ride height control which is tuned for touring. If this is not enough, add in the traction control and stability control for riding in just about any type of weather condition. The Interior is full of luxury amenities and since this vehicle is a beautiful convertible many passerby’s will be be able to see them including top of the line leather, a wonderful variety of woods, aluminum and much more. 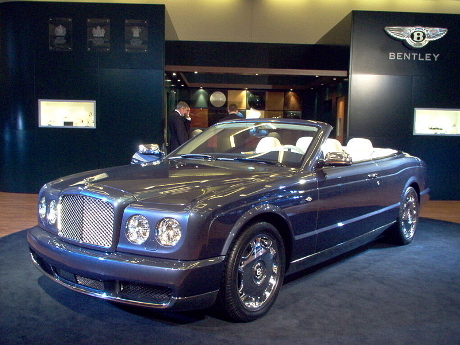 If you have the money, flaunt it with the Bentley Azure.